Wolstein Center, Cleveland State University, Cleveland, OH. CLEVELAND - Hulk Hogan returned to Impact Wrestling and had a shocking announcement about Bully Ray's title defenses and also shook up the Bound For Glory Series LIVE on IMPACT. After losing one member of their group, Devon, following a ten-man tag team match on Impact Wrestling, The Aces & 8s took to the ring to respond. World Champion Bully Ray began with questioning the members of the club as to what and why it happened. Then this lead to Bully Ray saying that he never even needed Devon before tensions boiled over with him and the vice-President, Mr. Anderson. Mr. Anderson seemed appauled when Bully Ray announced that new member Tito Ortiz would be getting his "own colours" so to speak. Bully Ray dismissed the counter and introduced Brooke Tessmacher, then gave the jacket to Tito Ortiz, as he was inducted into the group. Review: Appropriately booked start to the show. It has obviously set up for the next Impact and with tensions boiling over between Mr. Anderson and Bully Ray it is only a matter of time. The concept of the 'club' in The Aces & 8s is confusing for some viewers and the technicalities used in the promo do not help. Bully Ray moves on from the loss of his brother, Devon. But with tensions rising between him and Mr. Anderson, is Anderson next to be ex-communicated from The Aces & 8s? As the Bound For Glory Series drew to a close, it was high stakes as Jeff Hardy and Kazarian battled for more points. Jeff Hardy's athletic game was momentarily restricted with Kazarian overpowering the Charismatic Enigma. However, Jeff Hardy would find an opening, exploit it, then hit a Twist of Fate followed by Swanton Bomb to pick up points heading 3rd in the series (at that current time). Review: Quite a boring match. Formulaic ending and not much interest. The standard of wrestling was good but it just seemed boring for some reason. Predictable outcome. Jeff Hardy knocks off Kazarian as the Bound For Glory Series culminates gradually. Would Jeff Hardy remain in the Top 4 as the night concluded? #1 Contendership for the TNA Knockouts Championship was determine when Gail Kim wrestled ODB in a 2 Out of 3 Falls match. Gail Kim's tactic was clear. After submitting ODB with a leg submission to win the first fall, she would further damage the knee and get disqualified later on. This would leave it even, until ODB managed to persevere from a submission and in fact put Gail Kim in a submission forcing her to tap out. Review: The Knockouts get a lot of spotlight on the show. Long-run match but worked well. ODB vs. Mickie James should be interesting. ODB's victory over Gail Kim now solidifies her status as #1 Contender for the Knockouts title. Will she dethrone Mickie James next? The Main Event Mafia's Sting, Samoa Joe and Rampage Jackson addressed the TNA fans present in Cleveland after their victory in the ten-man tag team match last week. Rampage Jackson spoke out of the attack from Tito Ortiz, Samoa Joe was fired up and stated that the Mafia are back to running TNA, then Sting introduced AJ Styles - the man of who filled in for the Main Event Mafia in their winning match last week on Impact. AJ Styles had a lot to say, speaking about how he deserved better, how he needed the job and his hard work towards the company. It was a deep promo that really sent shockwaves through the roster. Fired up following his promo, AJ Styles was in a must-win situation in a great match against Booby Roode. There was some fine action from both stars, and desperation increased as the match got more intense. AJ Styles attempts to get more points with a submission were thwarted each time, so he won via a roll-up pin off the counter from a suplex. Review: Great promo, great match by AJ Styles. He really made an impact on the show, big turning point for him. AJ Styles heads to fifth place in the Bound For Glory Series. How would he fare by the end of the night? In pursuit of the final points in the series, Austin Aries battled Christopher Daniels. An excellent, excellent match between two fantastic wrestlers. Fast paced, technical and athletic - just great stuff. Austin Aries won eventually with a Brainbuster. Austin Aries soldifies his place in the Final Four at the Bound For Glory Series. Is he headed for Bound For Glory next? 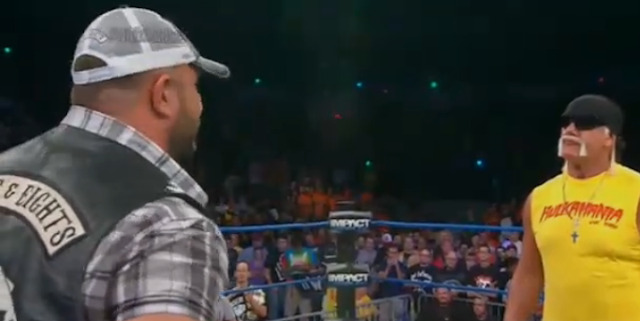 Hulk Hogan made a return to Impact Wrestling after being off the show due to business regarding the company, and he had an announcement before Bully Ray interrupted him. Hogan announced that the Bound For Glory Series will have one more gauntlet match, so it was not over. Then, Bully Ray made an appearance. Bully Ray tried to get in Hogan's head, but he would have none of it, before making a target to Aces & 8s, announcing that Bully Ray must defend his title against an Aces & 8s member, but before that, he would face Sting... next week. 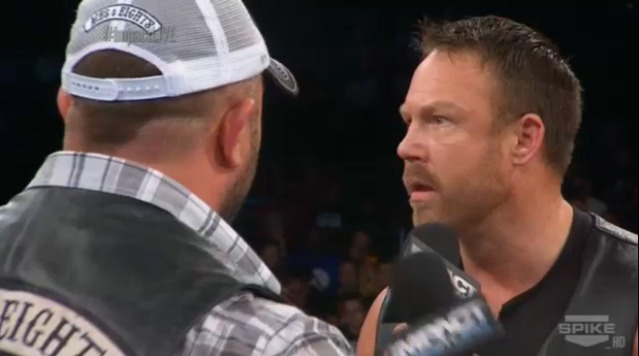 Sting will face Bully Ray for the World Heavyweight Championship next week. Is Bully Ray's time as Champion up? Strong show. Good caliber of matches and next week the BFG Series has one more match. The final segment seemed a bit rushed, but it was great. Superb buildup to No Surrender. The Icon Sting will challenge Bully Ray for the title next week. There is one more match in the Bound For Glory Series. Hulk Hogan has returned, and shook up things - major. Reports, coverage, review, media and more for the 490th Episode of TNA Impact Wrestling, broadcast LIVE from Cleveland Ohio. This wrestling event was by TNA.